Since early this year, local households have bred about 150ha of white-legged shrimp. In order to ensure safe and sustainable shrimp farming, the provincial Department of Agriculture and Rural Development worked with agencies concerned to monitor and offer environment warnings, control epidemics and adopt modern technology to raise shrimp up to VietGAP standards. Several firms have registered to raise shrimp on a total area of over 1,000ha with an estimated output of 17,700 tonnes and more. 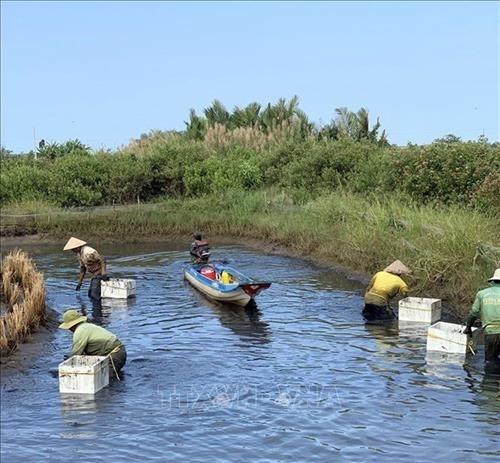 Last year, the province raised shrimp, mostly white-legged shrimp, on 2,590ha in Long Xuyen Quadrangle and U Minh Thuong, accounting for nearly 95 percent of the total area. The output of white-legged shrimp was over 18,100 tonnes out of the total 18,500 tonnes. Do Minh Nhut, Deputy Director of the department, said shrimp farming on industrial and semi-industrial scales in Kien Giang remains slow compared to the set target, mostly due to the lack of clean water supply and skilled workforce, unstable shrimp prices, and insufficient capital for technological adoption.